Look-ahead bias is a type of bias that occurs when a study or simulation relies on data or information that was not yet available or known during the time period being studied. It generally leads to inaccurate results from a study or simulation. The incorporation of fundamental data that wasn’t available at the time of the study delivers biased results that are close to the desired outcome but not to the real outcomes. 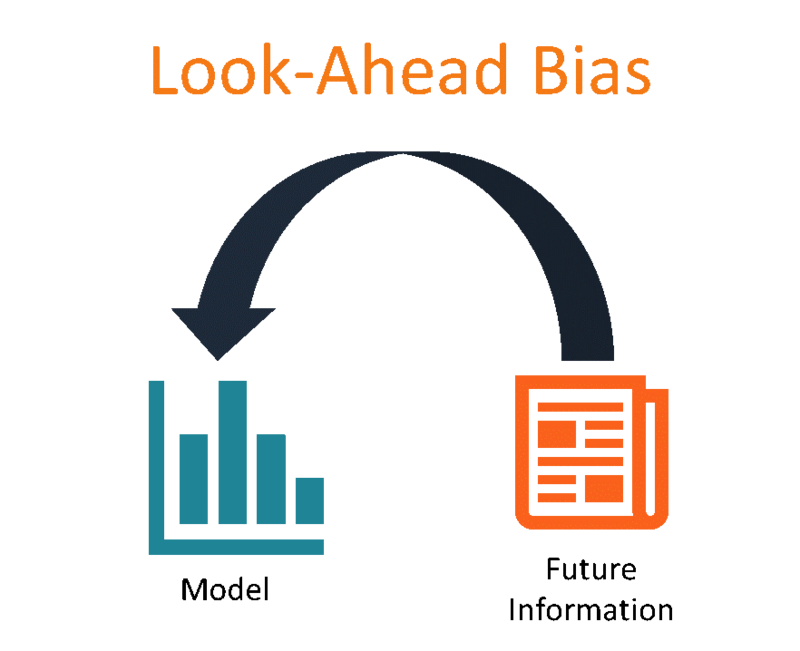 In finance, look-ahead bias is commonly encountered in trading strategies and various financial modelsTypes of Financial ModelsThe most common types of financial models include: 3 statement model, DCF model, M&A model, LBO model, budget model. Discover the top 10 types of Excel models in this detailed guide, including images and examples of each. Financial modeling is performed for many reasons including to value a business, raise money. If an analyst commits a look-ahead bias in a trading strategy, testing the strategy will likely return unreasonably positive results. However, the real application of the strategy is likely to deliver dramatically different results from those obtained during the testing process. One of the issues with look-ahead bias is that it is reasonably difficult to detect during backtesting. Backtesting is a process of applying a model or a simulation to historical data to assess the accuracy of a model or a simulation. In some cases, backtesting cannot signal that the model is biased. However, if during backtesting, the model returns an exceptional result, then that can be a red flag that there is something wrong with the model. Many finance professionalsFinance Salary GuideIn this finance salary guide, we cover several finance jobs and their corresponding midpoint salaries for 2018. Regardless of the industry, a good finance professional is difficult to find. Competition to hire and retain top talent in the fields of finance and accounting remains tough. involved in the development of trading strategies carefully review strategies that indicate returns above a certain level, for example, 20%. The best solution to avoid the look-ahead bias is a thorough assessment of the validity of developed models and strategies. Let’s consider that you work as a quantitative analystQuantsQuantitative analysts (also called “quants”) are professionals specializing in the design, development, and implementation of algorithms and mathematical or statistical models intended to solve complex financial problems. In their work, quantitative analysts apply a blend of techniques and knowledge at a hedge fund. You’re working on the development of a new trading strategy for equities. Your model assesses the relationship between the release of quarterly earnings reports and the stock price. The main assumption behind your model is that the stock price reacts to earnings reportsThree Financial StatementsThe three financial statements are the income statement, the balance sheet, and the statement of cash flows. These three core statements are intricately linked to each other and this guide will explain how they all fit together. By following the steps below you'll be able to connect the three statements on your own.. However, during the backtesting of the model, you assume that the company’s earnings reports are released on the same date as when the fiscal quarter closes. The situation is a classic example of look-ahead bias, given that the quarterly earnings reports become available only one month after the end of the quarter. Therefore, your backtesting incorporates information that was not available during the time being tested. Thus, the results of the backtesting are likely to be inaccurate. Belief PerseveranceBelief PerseveranceBelief perseverance, also known as belief persistence, is the inability of people to change their own belief, even upon receiving new information or facts that contradict or refute that belief. In other words, belief perseverance is the tendency of individuals to hold on to their beliefs even when they should not.